When someone mentions Texas, the first thing that comes to mind is probably cowboys, cattle ranching and the wild west. But while their western roots run deep, Texas is far from all lone rangers and tumbleweeds. This is especially true when in San Antonio. Nestled within South Central Texas approximately 150 miles from the Mexican border, San Antonio is one of the largest cities in the state. This hidden gem is an ideal and infrequent combination of great weather, fascinating culture, beautiful scenery and delicious food. A diverse mix of Spanish, Mexican, French and German influences have each left their mark on the city. Lively and affordable, there is a friendly and welcoming vibe every where you go. A burgeoning heaven for foodies, Texas is embracing a new wave of wine culture and a booming culinary scene. Whether you’re looking for a romantic getaway, a family vacation, a cultural immersion or a weekend of relaxation with your closest friends, San Antonio has something for everyone. It has never been easier to get to San Antonio than it is right now. On May 1st, Air Canada launched the first ever direct flight from Canada to San Antonio, departing from Toronto’s Pearson Airport. The daily, non-stop flight is fast, clocking in at just under four hours. 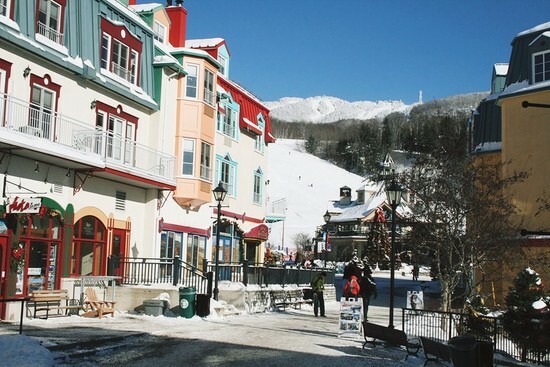 The service runs year-round and is operated by Air Canada Express. 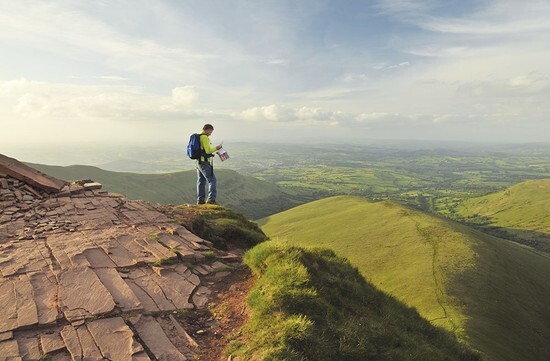 The new route comes just in time for the city’s big birthday next year, making them ready and rarin’ to go for the expected influx of visitors. The Hotel Emma is the epitome of southern hospitality. It occupies what was once the famous Pearl Brewery, the center of the historic Pearl Brewery District. This great location is city central, a stone’s throw from both the airport and the downtown core and surrounded by parks, shops and the San Antonio River Walk. 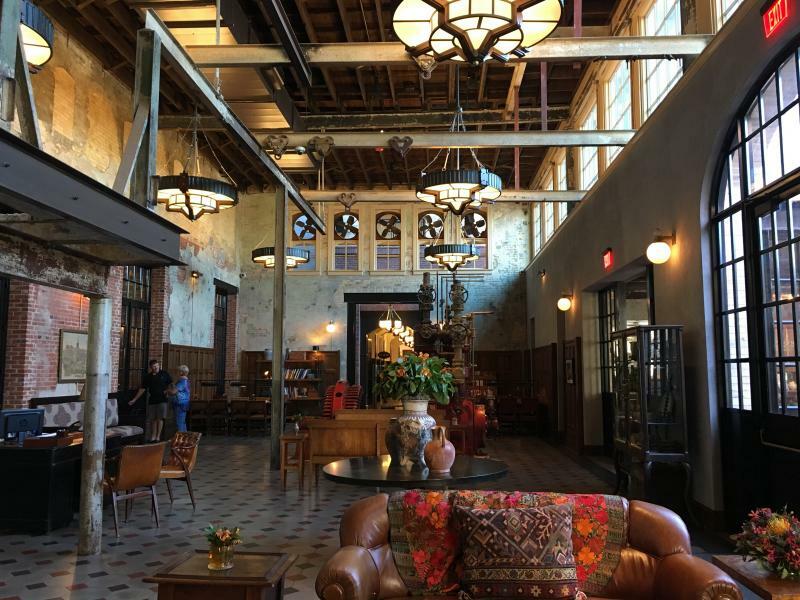 Much of the 19th century building’s interior, designed by Roman and Williams, is made up of refurbished and repurposed elements from the original brewery, lending it a chicly industrial yet weathered and homey feel. The main lobby features artifacts and machinery from its beer brewing history. Scattered throughout the airy but cozy space are vignettes of sofas and armchairs literally made for facilitating intimate conversation. It’s rustic luxury at its finest. All guests of the Hotel Emma are welcomed with a signature la babia margarita, best enjoyed in the library. The room features a sweeping double staircase and plush green club chairs available for when you feel like flipping through the 3,700-volume collection donated by local cultural anthropologist Sherry Kafka Wagner. Down an neighboring hallway is Larder, the Hotel Emma’s own kitchen goods shop. Stock includes a range of gourmet condiments, beverages, sweets, snacks and other kitchen goods, making it the perfect place to pick up an original souvenir or hostess gift. A fresh food counter serves up salads, lunch dishes and baked goods made daily in-house. Part of the hotel’s core mission to become a foodie’s paradise, an open demo kitchen fit for Julia Child is used to host wine tastings and chef demonstrations. 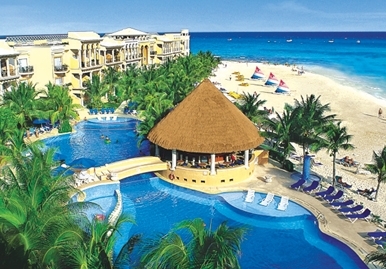 Did we mention the culinary concierge team dedicated to arranging custom cultural experiences? The rooms make you feel like an Old Hollywood movie star with high ceilings, rain showers, four-poster beds dressed in Frette sheets and floor-to-ceiling windows. Classic Texan and Mexican design filters into the decor juxtaposed by high-tech additions like Bose Bluetooth speakers and substantial flat screens. Even the robes have their own San Antonio spin, custom-made in the local Guayabera style by Dos Carolinas. 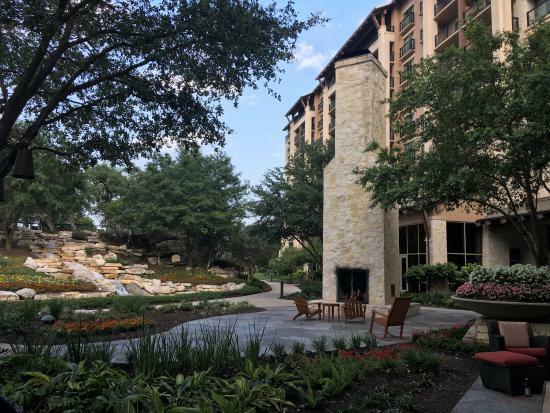 For a quiet retreat to get away from it all, the JW Marriott San Antonio Hill Country Resort & Spa fits the bill. The award-winning hotel offers the best of Texas Hill Country, with 600 acres of gorgeous country greenery. All that space is partially composed of seven restaurants, a sophisticated business lounge, a nine-acre water park and a top notch 36-hole TPC San Antonio golf course, proving the age-old adage that “everything is bigger in Texas.” Indulge yourself by spending a day in full-on relaxation mode at the soothing and spacious Lantana spa. If lounging around in the sun with a good book is more your style, the lazy river will be your new home away from home. If you’re traveling with kids, the Hyatt Regency Resort may be more your speed. The resort's ranch roots are clear in the western charm of everything from the décor to the food. Pick up your morning coffee from in-house cafe MKT Place before enjoying a luxurious spa day in a renovated barn. Right next to the River Walk, guests have easy access to the area’s shopping, dining and cultural excursions. The resort also houses Q Kitchen | Bar, specializing in creative takes on local dishes and pouring Texas microbrews. The Texas shaped pool is sure to please the little ones, but our favourite feature is the massive front porch where guests can sit back and relax in a rocking chair to waste the day away. For some of the best restaurants that San Antonio has to offer, head no further than to the Pearl Parkway. Botika dishes up incredible and unique takes on Peruvian-Asian fusion. The Latin American influence is evident through the use of ingredients like plantains, corn or aji amarillo, while the Asian inspiration is clear in the miso, szechuan and seafood selection. The staff is always on the ball, offering genuine suggestions and willing to answer any and all questions. And don’t even think about skipping dessert; the three sorbets alone are worth the trip. 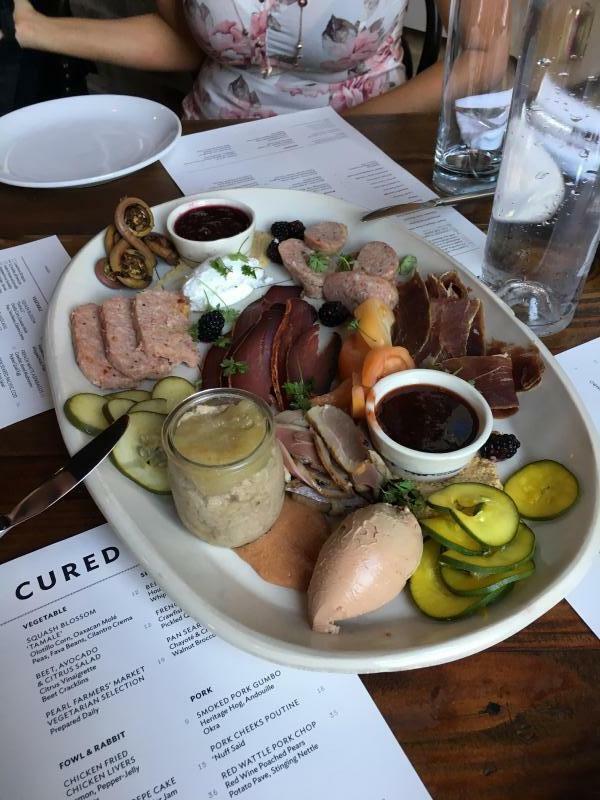 You may have never truly had good charcuterie if you have not dined at Cured. Ideal for the resident carnivore, meats in their specialty creations are cured in-house anywhere from 30 days to 12 months. Having come to San Antonio after stints in New Orleans and Walworth, Chef Steve McHugh brings the tastes of those regions to his work. The décor is chic and trendy, the service is exemplary and they make a mean craft cocktail. Specializing in viennoiserie, Bakery Lorraine is a little spot nestled off the Pearl Parkway. From croissants to macarons, it’s a Francophile’s dream. Not only is their selection of handmade baked goods extensive; they also serve classic French bistro items like quiche Lorraine and croque madame. Plus, everything is handmade. Supper, housed within the Hotel Emma, embraces the timeless American pastime of eating good food with good friends. Created with the goal of making the hotel a culinary hotspot, the restaurant pairs multicultural flavours with South Texas cuisine. Chef John Brand brings 25 years of experience to the table, having worked his way up from self-taught novice to acclaimed chef. Located right next to the San Antonio river, it merges the ambiance of a traditional French bistro with farm-to-table freshness. Nothing beats their ricotta beignets washed down with an Oaxacan Hot Chocolate. For a Tex-Mex infused breakfast, try Mi Tierra Café y Panaderia, family-owned since 1941. Taking up an entire block of Market Square, it’s open 24/7 and is considered a local landmark. The café is decorated in a plethora of lights, piñatas and stained glass. Murals coating the walls are in tribute to the founders of the café, as well as famous Mexicans and Mexican-Americans. Try their breakfast tacos or the Chilaquiles Famosos. The Fruteria, run by Chef Johnny Hernandez, is modelled after the bright and colourful fruit stands native to Mexico. Meant to resemble a typical Mexican Botanero, it’s a casual post-workday meeting spot. The menu shifts over the course of the day, from fresh fruit cups, tortas and tostadas by day to cocktails, botanas and antojitos by night. 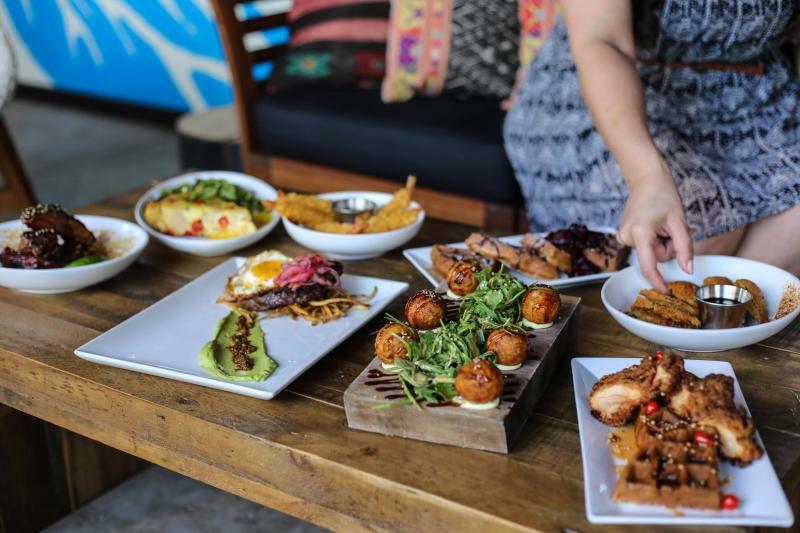 If you find yourself taking in the downtown nightlife and looking for a bite, Ácenar is the place to go. Serving Tex-Mex with a twist, Executive Chef Richard Sánchez knows his stuff. 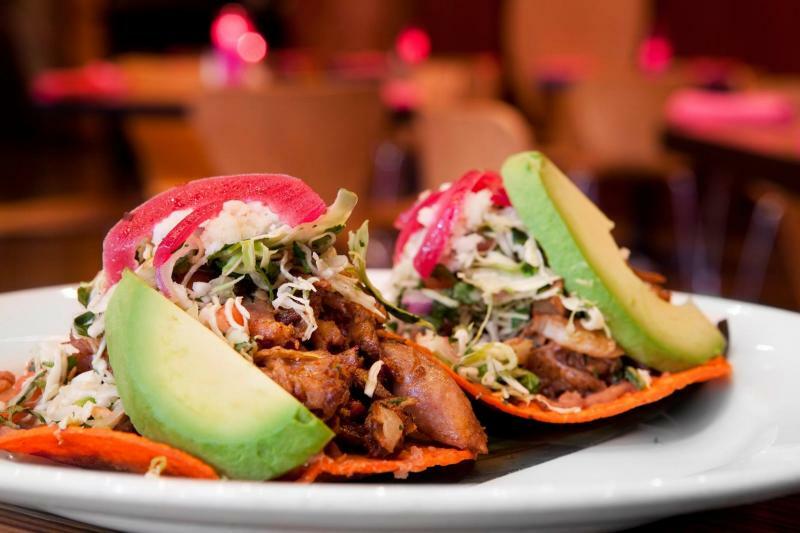 One of the biggest Mexican restaurants in the city, its multiple levels provide ample indoor and outdoor seating. Plenty of plates are sized to share and happy hour deals include a wide range of Latin cocktails, making it a great place for a night out with a big group. One of the most famous and most beautiful attractions in San Antonio is the River Walk. 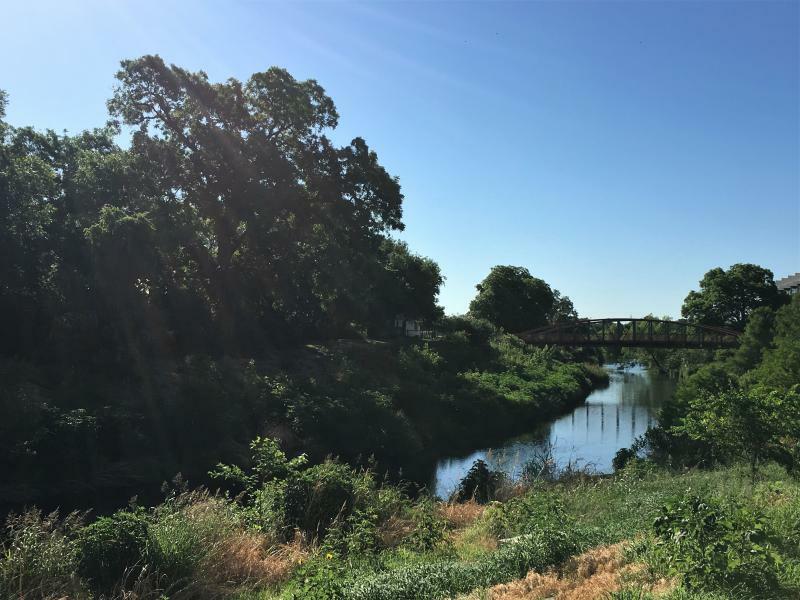 Featuring more than 15 miles of uninterrupted trail running between Brackenridge Park to Mission Espada, the walk is divided into three sections - the Museum reach, Downtown reach and Mission reach. Traversing the city, it’s the bustling beating heart of San Antonio’s social scene, a commercial center bordered by restaurants, museums, hotels, shopping, parks and historic buildings. The river is also a hub for recreation, a mecca for hikers and paddlers sustainably protected by the San Antonio River Authority. Take a tour either by foot, boat or bike, depending on how athletic you’re feeling, to check out the gorgeous greenery, running rapids and occasional string of ducklings. 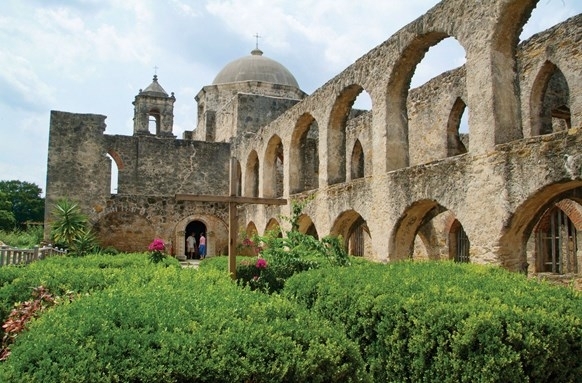 The San Antonio Missions National Historic Park is an absolute must see. Composed of four traditional Spanish colonial missions formed in the 18th century – Mission San José, Mission San Juan Capistrano, Mission Espada and Mission Concepción – the park is the first World Heritage Site in Texas. Their architecture is diverse and they house Spanish art from the colonial era. The Mission San José, largest of the four, is a particular standout with intricate stonework, the baroque Rose Window and a restored horizontal wheel wheat mill. Admission to the park is free, as are guided tours. You can’t go to San Antonio and not visit the Alamo. 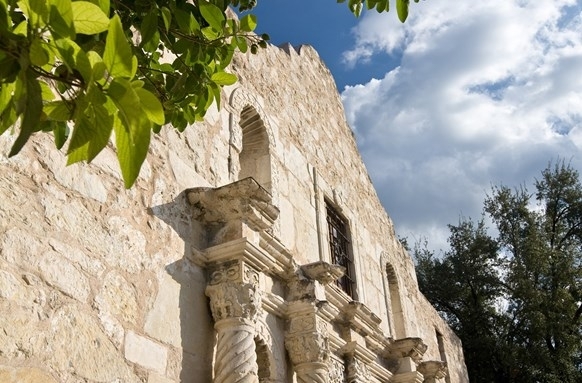 Get your history fix by visiting the most frequented historic landmark in the state, the place that played a vital role in the fight for Texas independence and the development of San Antonio. Delve 300 years into the past and discover how the city’s first Spanish mission was transformed into a military fortress. Live historical re-enactments, rotating exhibitions, educational programming and special events enhance your learning. The site is free to visit 365 days a year, but guided tours providing details of the heroes, the buildings and the battlefield are available. Make sure to swing by Market Square (El Mercado), the core of the city’s Mexican culture and the biggest Mexican style market in the United States. Watch live performances by dancers and mariachi bands while you explore the stores, dining options and produce stands. Pick up an original work by a local artist or satisfy your sweet tooth with one of the authentic Mexican desserts. 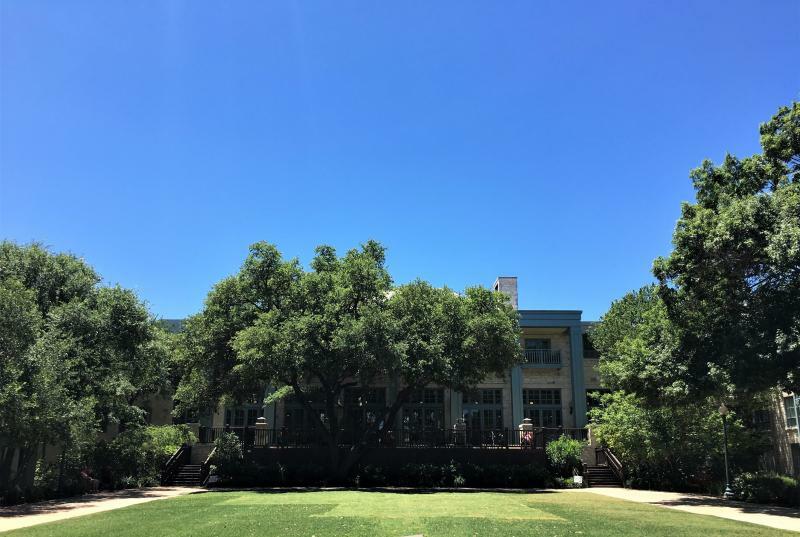 Fixin’ to prepare for the tricentennial, the Witte museum just opened their doors after a massive $100 million renovation, resulting in over 100,000 square feet of new digs. Learn about the history, science, art, culture and natural landscape that make up Texas heritage, from the rock art of the people of the Pecos to the dinosaurs that roamed the wild west over 110 million years ago. 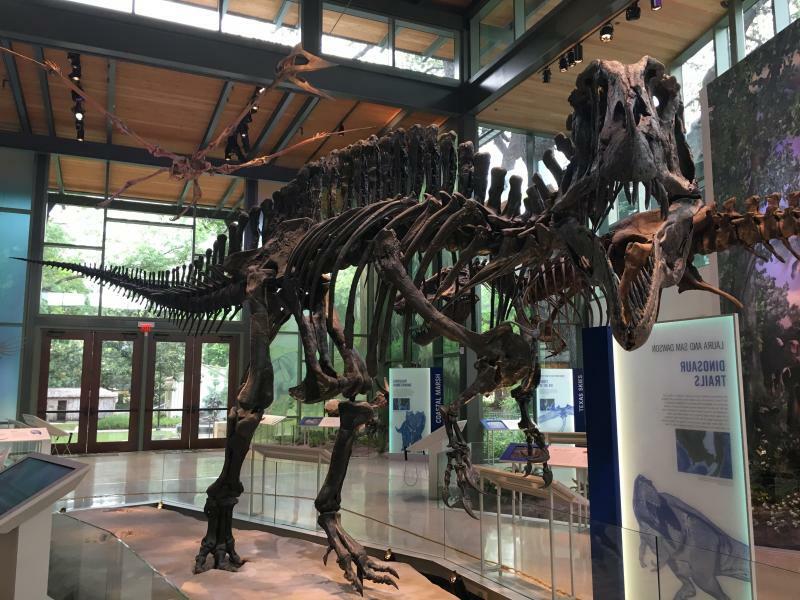 The high-tech facilities, open year-round, now include an H-E-B Lantern with a life-sized Quetzalcoatlus, an updated great hall and theatre, an Acequia Madre from 1719 and the Texas Wild Gallery with state-of-the-art displays. Taking up 25 blocks of downtown on the south bank of the river sits the King William District. Once the most sophisticated and high-end residential neighborhood in the area, the preserved 19th century homes are now repurposed as quaint cafes, galleries and museums. Fredericksburg, located in Texas hill country, makes for a great day trip just a short drive from San Antonio. Brush up on your history at Fort Martin Scott, the Pioneer museum or the National Museum of the Pacific War with interactive exhibits and live historical re-enactments. 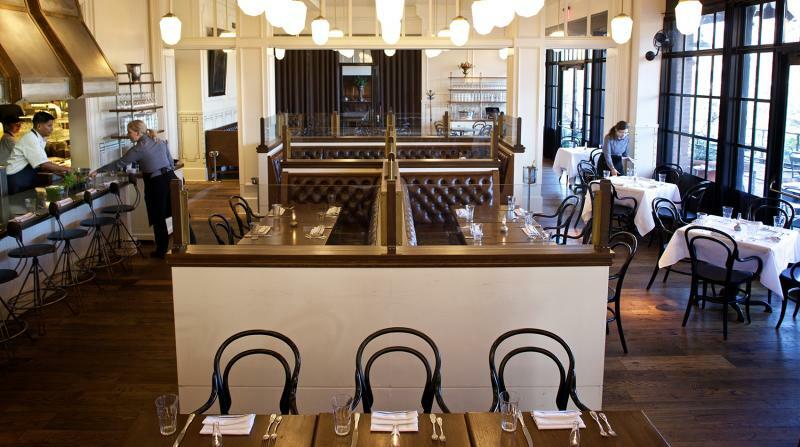 If you’re feeling peckish, local bistro Vaudeville serves New American dishes made with local ingredients. Then, hit Main Street for some shopping, where many stores occupy original buildings, antiques shops abound and only local businesses are allowed. 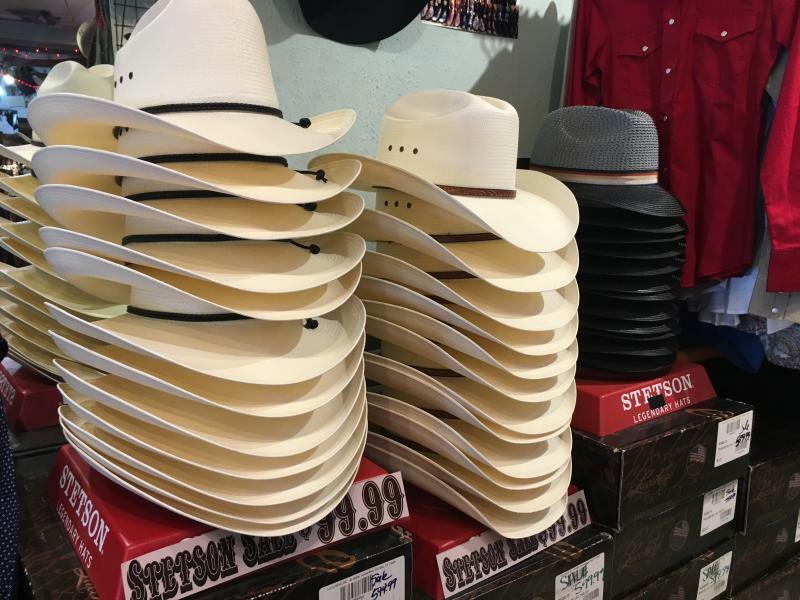 Highlights include a shop dedicated offering every flavour of hot sauce imaginable, old-fashioned ice cream parlour Clear Water Pecan Co. and a place to pick up a real deal cowboy hat or customize your very own pair of cowboy boots. On your way back from Fredericksburg, make a pit stop in Luckenbach. The main draws of this traditionally tiny Texas settlement are an authentic old school dance hall and a post office whose doors have been open since 1849. Make sure to take a look at their display cases showing off the items they sold back in the day. Then, take a seat at one of the picnic tables by the outdoor stage area to watch the roosters in the oak trees or a guitarist crooning a blues tune. Texas is up-and-coming wine country and Becker Winery is the perfect place to sample the bounty the area has to offer. 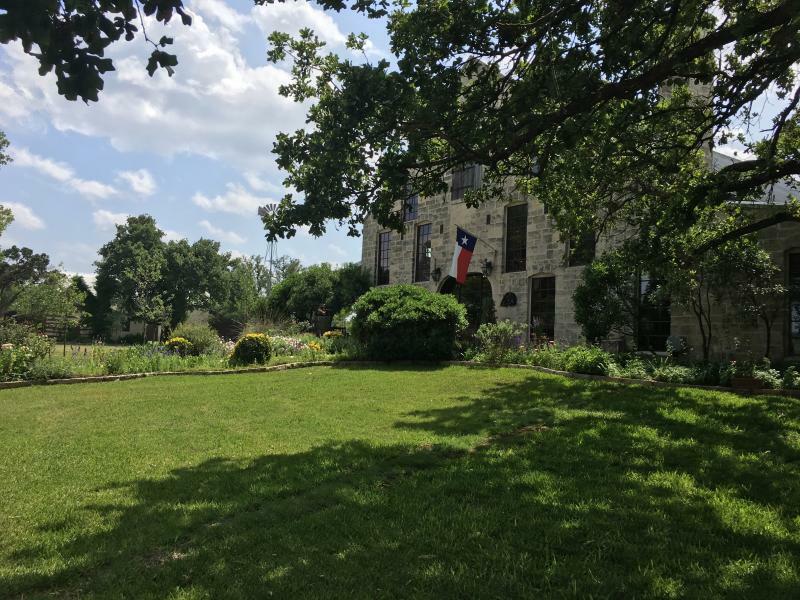 What is now a successful commercial winery began when the Beckers set out to remodel a log cabin into a personal Hill Country retreat, only to find that the grounds happened to come with 46 acres loaded with Mustang grapes. The estate is a short drive from the main city and sits on vast vineyards, lush grasslands and fragrant lavender fields. Since the first harvest in the mid-nineties, they have grown to house 74 tanks and 2000 barrels, producing over 100,000 cases per year. Hourly tours of the winery are offered on weekends and tastings of the many varieties are highly encouraged. For more help with trip planning, go to the Visit San Antonio website.